New Casino Game Every Month! Visit Silver Oak Get Your Bonus! Silver Oak Casino welcomes UK players. Safe & secure banking methods ? All legitimate, real-money casinos like Silver Oak Casino have strict anti-fraud screens, and that may create a short withdrawal delay. Silver Oak Casino are offering a great welcome bonus. They'll match your first three deposits at 100% allowing you to earn up to $1000 in bonus cash. ? The bonus applies to your first deposit only. Please read the terms and conditions carefully and make sure to take full advantage of the bonus offer. Silver Oak Casino is that rare online casino that continually distinguishes itself from the competition. Although all online casinos promise fast payouts, secure banking and great game selection, Silver Oak delivers on all fronts. 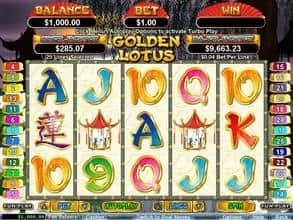 It’s a casino that caters to every kind of player, from the penny-slot aficionado to the high rolling online blackjack player, and continually strives to make the online gaming experience as fun and as rewarding as possible. 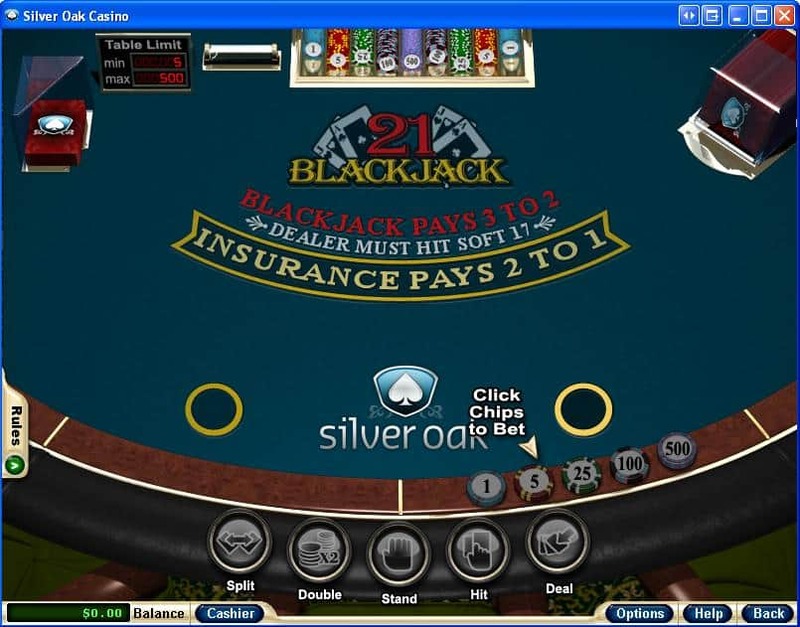 Silver Oak is powered by Realtime Gaming, which has earned a global reputation for being one of the finest casino software providers in the business. Realtime’s high-end software features outstanding gameplay and exquisite graphics, and most of their games are available in both download and webplay versions. Silver Oak games are also available for play as smartphone apps, and can be accessed with both Mac iOS and Android operating systems (so, yes, you can play on your iPad or cell phone via an app). And meanwhile American gamers will be thrilled to learn that Silver Oak Casino is available to US players. One of Silver Oak’s calling cards is its terrific assortment of games. There are over 150 games available, including an entire galaxy of slots and video poker options, as well as all of your favorite table games, including blackjack, let ‘em ride, Texas hold ‘em bonus poker, pai gow poker, baccarat, war, and Vegas three-card rummy. 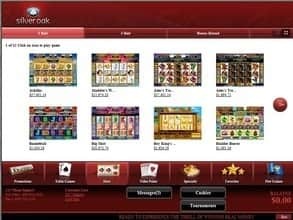 No Silver Oak casino review would be complete without a mention of its slot action, which is some of the best on the web. 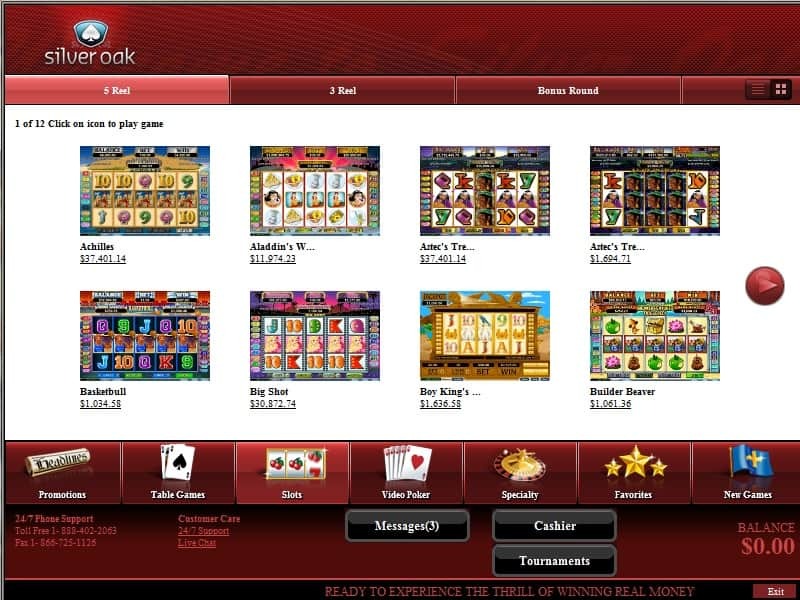 At present, Silver Oak offers over one hundred different slot games. No, that’s not a typo. It really does! Some of the most popular games at Silver Oak are their ‘Real Series’ video slots, which feature some of the most exhilarating (and, on a good, day the most profitable!) bonus rounds in the industry, as well as the option of playing up to 25 paylines. 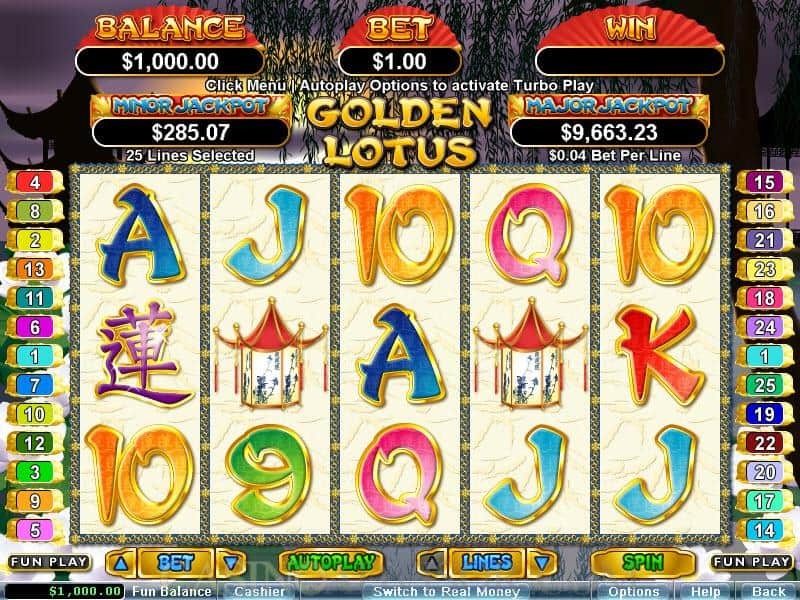 The casino also offers video slots such as Food Fight and Jazz Time, as well as an outstanding portfolio of old-school three-reel slot games like Diamond Mine, Sevens and Stripes and Triple 7 Inferno. For players who like a traditional three-reel game with a bit of a twist, Silver Oak also delivers a handful of bonus three real games; examples include High Rollers, Operation M.Y.O.W., and Pharaoh’s Gold. Silver Oak offers just about every traditional table game that you could ever want to play, and the action doesn’t stop there. If you’re the kind of player who likes games that come with an exciting wrinkle or two, you’re going to love all of the blackjack variants that Silver Oak has on tap, such as European blackjack, face-up 21 (you’ll never have to wonder what the dealer’s hole card is ever again! ), match play 21, super 21 and perfect pairs. Silver Oak also boasts three different variations of roulette (American, French and European), as well as time-honored favorites such as keno, bonus bingo and craps. A casino with this many games on offer can take a while to navigate, so you might want to consider giving some of the free games a whirl. Once you’ve grown accustomed to the graphics and game speed you can step up and play for real cash and make your first deposit. Once you’re playing for real money, just relax and enjoy the action. One thing we can promise is that you don’t need to worry about the integrity of the games at Silver Oak; Realtime Gaming is one of, if not the, most reputable software providers in the online casino business, and Silver Oak has been CDS certified. Silver Oak supports a wide range of banking options, including Neteller, Person2Person, and major credit cards. The absolute finest in modern encryption technology ensures that all of your transactions are safe, and that your personal information is completely secure. 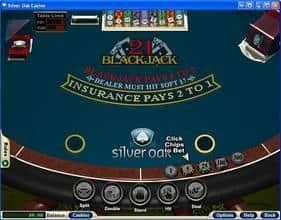 Silver Oak also supports the Player’s Reward Card, which operates much like a traditional, pre-paid credit card and can be used to fund accounts at any number of online casinos. Next nine deposits: 100% match bonus up to $1,000 (note: each bonus requires a different coupon code. For example, the first deposit bonus code is ‘silveroak1’, while the second is ‘silveroak2’, etc.). A “sticky” bonus, which means that the bonus money can never be withdrawn. For example, say you deposit $700 and collect the $700 bonus. You give Silver Oak $42,000 in wagering action in the allowable games, which means the 30x wagering requirement has been satisfied. At this point, if you are withdrawing over $700 you must have a balance over $1,400. These requirements apply to both the initial bonus and to any subsequent deposit bonuses that you may redeem. If you have any questions about the bonus program, remember the golden rule of online gaming: “When in doubt, call and find out.” Ninety-nine percent of online gaming headaches can be prevented by contacting customer service before you begin playing. Silver Oak customer service is available 24/7. No deposit bonus: Silver Oak has a set of blanket policies for all no deposit bonuses (free chips, free spins, free-roll slot tournaments, etc.). We won’t bore you with all the details (they’re available for review on the website), but the rules and restrictions are in line with industry standards, in that the wagering requirements vary between 30x and 60x, and the maximum withdraw is 2x the face value of the bonus. In addition to the usual complement of matching and no deposit bonuses, Silver Oak offers its players a whole host of other perks and extras. 50% Cash Back: This promotion is available to anyone who makes a real money deposit and chooses not to redeem a deposit bonus. Once you’ve played through 30x, or 60x on blackjack or video poker, you’ll be eligible to receive back up to 50% of your original deposit. Deposits of $1001 to $5000 are eligible for 30% cash back, $5001-$10000 are eligible for 40%, and deposits of $10001 or more are eligible for the full 50%. Monday: The Happy Hour promotion (150% extra on any bonus on between 5pm and 7pm). Tuesday: Double comp points on all blackjack games. Wednesday: The Triple Threat promotion, which gives any player who made a real money deposit on Monday, Tuesday or Wednesday a free $50 chip. Thursday: The Thursday Thriller gives you $55 for a $25 deposit. You can use this promotion as many times as you’d like, all day long. Friday: Gives players who wager $50 on one of the newest games a $10 credit for being one of the first players to give the new game a go. The list of qualifying games changes, so make sure you check the promotion schedule each Friday to see what games are eligible for that week. Saturday: Double comp points when you play any of Silver Oak’s Super Sports games. $10K Draw: Every month, Silver Oak dishes out a $10,000 chip to one lucky player. All a player needs to do to become eligible for this gem is make three or more real-money deposits in the calendar month. Crewpon: This unique bonus program actually gets bigger as more players redeem it. Once 10 players have redeemed the Crewpon, the bonus is activated at $25 per player. Once 50 players redeem it, however, the bonus amount rises to $50. As more player jump on board the bonus continues to grow, before finally topping out at $1,000 after 1500 players claim it. To further sweeten the pot, Silver Oak offers a 290% match bonus for VIP players when they use the CREW290 bonus code. Bankroll Protection: A great little perk for the player who just can’t seem to stop doubling-down on hard 12, this promotion gives the player a credit of 10% on their real money losses. If you make a deposit, for example, and can’t turn a profit, you’ll see this little nugget in your account balance the following week. Blackjack Bonus: This bonus starts off at 21%, and can rise to anywhere from an additional 121% to an eye-popping 161%, depending on the size of the initial deposit. The usual terms and conditions apply. Free Spins: Free spin promotions come up from time to time at Silver Oak, so keep your eyes out for them. Right now, they’re offering 20 free spins for players who access the games through a mobile device. A quick read of the tea leaves suggests that Silver Oak might start heavily promoting their games for play on mobile devices, so players who like to access games via mobile phone, iPad and iPhone just might see some exceptionally generous offers coming down the pike in the months to come. 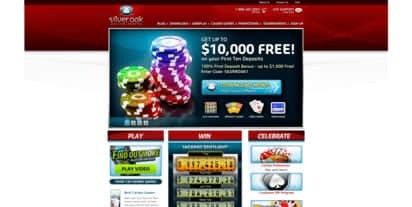 Join Silver Oak Casino and earn up to $1000!